In the '70s, Mego was famous for its line of 8" action figures. The first (and, for decades, only) company to produce action figures of both Marvel and DC characters at the same time, Mego lumped both properties together under one banner: World's Greatest Super-Heroes. Mego applied for a trademark on the term "super-hero," which wasn't taken too well by the folks at Marvel and DC. They both threatened legal action, Mego (smartly) gave in and handed over the rights to the term... to both companies. 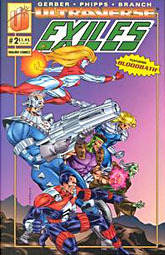 Marvel and DC have jointly owned "superhero" ever since, which is why whenever any other company wants to do superhero comics, they have to come up with a new word, such as Malibu Comics' term, Ultras. Death is no stranger or threat to Ghoul, who mastered the netherworld and came back from the dead. His Ultra powers let him summon spirits from the dead and predict the gruesome deaths of others. Although invincible, Ghoul feels pain when he loses an arm or a leg - which happens often. Okay, that's not entirely accurate. Ghoul neither mastered the netherworld nor came back from the dead. He caught something called the "Theta Virus," which gave people super powers, but also caused early death. Ghoul's powers were that he looked like mortified flesh. Smelled like one, too. His body had the consistency of a cadaver, but he was still alive. That's what the disease did to him. Oh, and he also didn't feel any pain, meaning that almost nothing in his bio is correct. Neat! 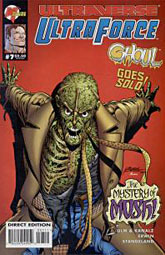 Ghoul began (un)life as a member of the Exiles, one of the most surprising books ever to come out of the '90s. See, it was an ongoing series, and selling good numbers, but at the end of the fourth issue, there was an explosion and the entire team died. Really died. A couple were vaporized in the blast, one guy had severe internal injuries, someone else ended up in a coma and never came out of it... they were really gone, and that was the final issue of the series. No advance warning, no hype, the book was just ended. They'd even solicited issues 5 and 6 in Previews, to preserve the surprise - their enemies in those issues, by the way, were going to be The Hoaxter and the Carnival of Lies. Get it? Clever! In any case, Ghoul eventually reformed himself (hey, what do you want - it's explicity his power to survive death) with a new look and was invited to join the new superteam, Ultraforce. Anyway, Ultraforce got turned into a cartoon, and the cartoon got tie-in toys, and here we are. The figure is made in a 5" scale, as was the style at the time. The sculpt is based on Ghoul's second appearance, as designed by George Perez. That means his face is more decayed, and he has a number of inexplicable bones on his head. Seriously, it's like he found a chicken's ribcage and wrapped it around his head or something. His skin is wrinkly and puckered, his teeth are exposed and his eyes rest in deep black sockets. Ghoul definitely looks dead. Articulation is pretty average for a toy made in 1995. He has swivel peg joints at the neck, shoudlers, waist and hips, then hinged pins at the elbows and knees. His action feature is that his head and arms are removable: just pop them off the torso for dismembering action! The paint is particularly good for a toy of Ghoul's vintage - yes, it's amatuerish by modern standards, but back then this would have been above-average. His belt gets a separate paint app to set it apart from his trenchcoat, and all the rips in his clothing are painted green to match his skin. Some of his bones are also painted with glow-in-the-dark paint, so put him near a light sorce for a bit and he'll light up. 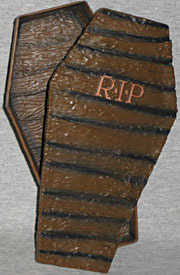 Ghoul has a large accessory, too: a two-piece coffin. Both the body and the lid are sculpte dto look like wood, and there are a few spiders (and webs) sculpted on, as well. The paint is nice, with a darker brown airbrushed onto the lines between the individual planks. There's a gear-action feature which is supposed to allow you to raise Ghoul up out of the box, but it's too weak to actually work the way it's supposed to. One neat feature of the sculpt? Ghoul has apparently been in the coffin for 93 days: there are counting scratches on the inside of the lid. 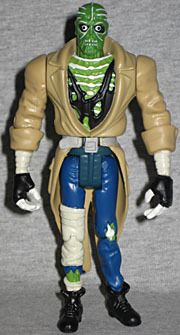 For a mid-90s toy, Ghoul stacks up pretty well today. If you want a nice, cheap zombie figure, you can't go wrong - even if you've never read the books. Picking him up certainly won't set you back very much, but the toy is fun and the design is nice. Malibu really put out some good superhero comics, until Marvel bought the company to get control of its computer coloring department and cancelled all the existing books. So technically, Ghoul is now a Marvel character. Similarly, the Ultraforce toys were made by Galoob, which is now owned by Hasbro - current holders of the Marvel license. How about that! Don't expect to see any Ultraverse characters in Marvel Legends, though: Malibu's creators had fairly lucrative contracts, which gives them a bigger share of any profits than Marvel is happy with, so they steadfastly refuse to do anything with the characters.